​​ ​In these 3 hour, One Day in-house beginner intensives, you'll learn the fundamentals of Draping. 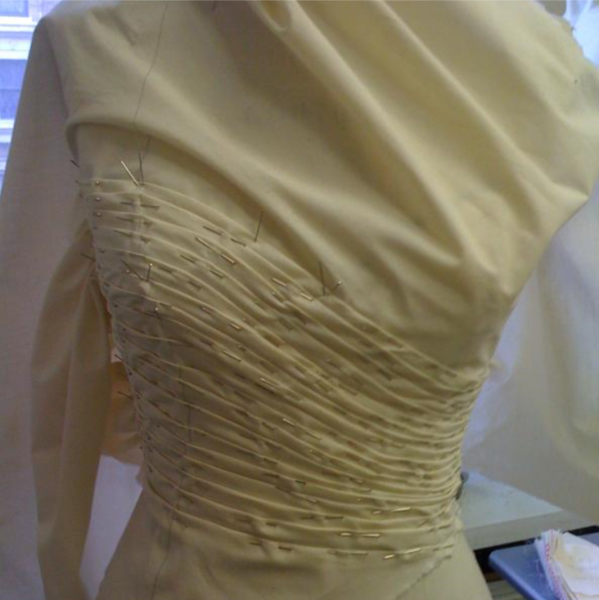 Draping is the process of creating garments directly in fabric instead of using paper patterns. This technique teaches the relationship between your fabric, your figure, and fashion in a way that no other method can. You'll use an actual 3 dimensional body (a dress form or a human figure) to learn professional draping skills and techniques. Who should take this class? This class is taught in the classroom. It is a great class for those with no skills in draping or for those who sew but with no technical training, yet want to take their design skills to the next level. Once you master this art, you can design to your heart's content! Some designers perfect work on the flat pattern, but there is nothing more exciting than designing in 3D and seeing your ideas come to life right in front of your eyes! Each student should wear a tight fitted top with high rounded neckline (but no collar), like a leotard, since students will team up and drape on the human figure...like the ateliers do. Everyone will leave with their own custom draped sloper pattern, from their measurements/figure.